With the exterior of a polished piece of peppermint, Crumbelina DiCaramello is the poshest racer in Sugar Rush. But when it comes to racing, extravagance and wealth doesn't distract DiCaramello; she considers herself as a down-and-dirty racer. 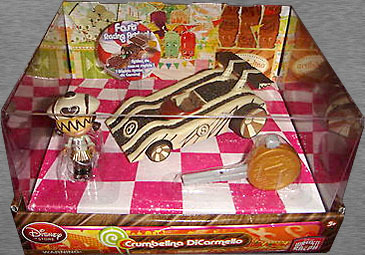 Crumbelina is the "fancy" racer - Taffyta Muttonfudge might be available in bulk bags at Sam's Club, but you can only get an individually wrapped Crumbelina DiCaramello at Godiva or Gertrude Hawk, you know? 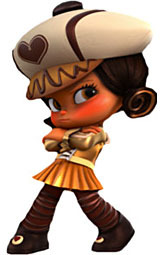 Her skirt is a paper wrapper, just like Vanellope's was, but gold foil instead of plain brown. Her leggings look like Twix with chocolate drizzles, and the buttons on the front of her shoes are jelly-filled cookies. 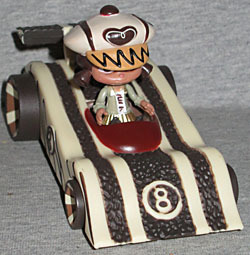 She wears a big, floppy hat that has chocolate piping on the brim; where her brown hair has been pulled into pigtails, the ends look like cinnamon rolls (though the toy is missing the caramel-colored paint apps on the swirls). DiCaramello's car is called the Tira-Missile, an obvious reference to the Italian desert tiramisu - something appropriately decadent. The design doesn't really look like tiramisu, however. Rather, it's more like a wedge of layer cake. The dark sections have a pitted, spongy texture - like cake! - while the cream sections are smooth and crisp, like icing. 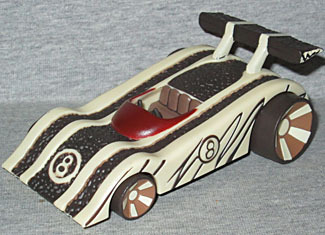 There's chocolate drizzle on both sides, and the wheels look like fancy Rolos. 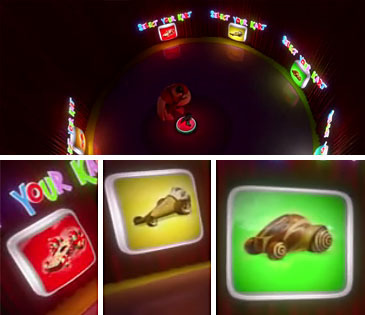 When Vanellope went to make her own Kart, the factory had several different options: one that seemed to be based on a Pop Tart, another that was clearly a Drumstick or Cornetto, a third that was made of cinnamon buns and shaped like WfC Bumblebee, and a fourth that was a wedge of cake (plus, judging by the size of the room, four more that we don't get to see). In that case, Crumbelina's car is probably the same base model as Van's, just made better: it's got the scoop front, the curve over the front wheels, and the spoiler in the back. It's 4⅛" long, 2½" wide and 1¾" tall. The racer sets are sold in nice boxes that display the toys well. The entire top is clear, allowing full views of the car and the figure (as well as the golden coin key). The bottom of the display is pink and white checkerboard, showing the start/finish line, while the back shows some of the grandstands - the gumdrops that are marks for Minty Zaki, the hard candy that can't get enough of Swizzle "The Swizz" Malarkey, and Crumbelina's own teddy grahams. This is a really lovely display, perfect for MOC collectors. Side note: the box calls this toy "Crumbelina DiCarmello," but every other source, including the film's credits, spell her last name "Caramello," so we went with that.